Lewis Bruce enjoyed an outstanding game for Cambs against Beds. Local lads Sam Rippington and Harrison Craig combined to deliver a terrific win for Cambridgeshire in the Eastern Division of the Minor Counties Championship against Bedfordshire today (June 20). Wisbech seamer Rippington and teenage Oundle/Nassington spinner Craig came together with Cambs requiring 33 with two wickets in hand in a tense contest at Luton. They were facing rampant ex-England slow bowler Monty Panesar who had just claimed his fifth wicket of the innings. But the Cambs bowlers showed tremendous patience and technique to grind their way to victory. Rippington, who is usually a bit of a dasher, finished unbeaten on 22 from 45 balls, while Craig faced 36 balls for his 11. 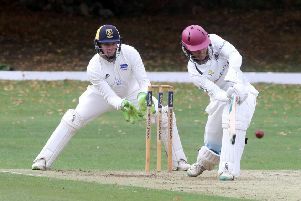 Earlier Cambs’ skipper Lewis Bruce completed an oustanding match by making 51 after Cambs had been set 167 to win. Bruce also took 10 wickets in the match, although bowling honours today belonged to his Peterborough Town team-mate Joe Dawborn who took the final three wickets to fall as Beds added just four to their overnight score of 90-7. The win also featured a debut first innings ton for Burwell’s Joe Tetley. It was a first Championship win of the season for Cambs whose first game against Lincs was eventually washed out. Scores: Beds 339-9 (B. Howgego 118, L. Bruce 6-100) & 94 (L. Bruce 4-18, J. Dawborn 4-32, S. Rippington 2-31). Cambs 267 (J. Tetley 112, B. Smith 35, L. Bruce 34, A. Bramley 26) & 167-8 (L. Bruce 51, A. Bramley 24, S. Rippington 22no, M. Panesar 5-52).